Designed by Erik von Shoultz and Joakim Norin. Foods that come in a shell can be intimidating. One wrong move and you’ve sent a walnut shell sailing across the room or squirted lobster juice in someone’s eye. As a host, you could avoid serving any projectile-prone nuts or boiled crustaceans… or you could keep them on the menu and celebrate their quirky armor. With the right tools, the ritual of shelling nuts and cracking shellfish is as enjoyable as the prizes inside the hulls. Friends since childhood, Swedish designers Oscar Löwenhielm and Erik von Schoultz reinvented the traditional nutcracker when they founded Drosselmeyer Design Group (which is named after a character in The Nutcracker ballet). Their creation uses a double lever to swiftly crush even the hardest nut shells without requiring a herculean effort. A cone-shaped chamber catches the shells to avoid spraying fragments, and most of the meat of the nut stays intact since the cracking bar doesn’t penetrate past the shell. The entire cracking assembly, made of die-cast zinc, is detachable for easy cleaning. After the success of their innovative nutcracker, Oscar and Erik turned their attention to sea creatures. 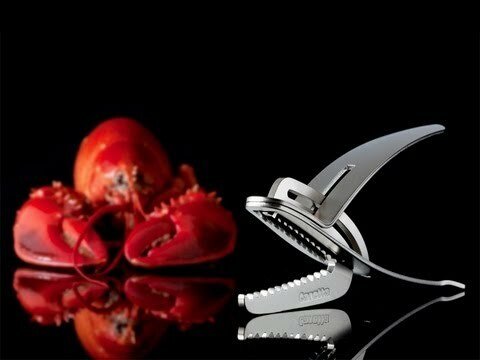 Their Caretta shellfish pliers have a spring-loaded handle and use the same double-levered action to crack lobsters, crabs and crayfish. The stainless-steel gadget has serrated teeth to securely hold your shellfish while the shell is crushed from underneath, so the meat isn’t smashed and any sea juices flow onto the plate. Sleek, durable and effective, Drosselmeyer’s nutcracker and seafood pliers get the job done with impeccable style. Design and function are brilliantly interwoven.